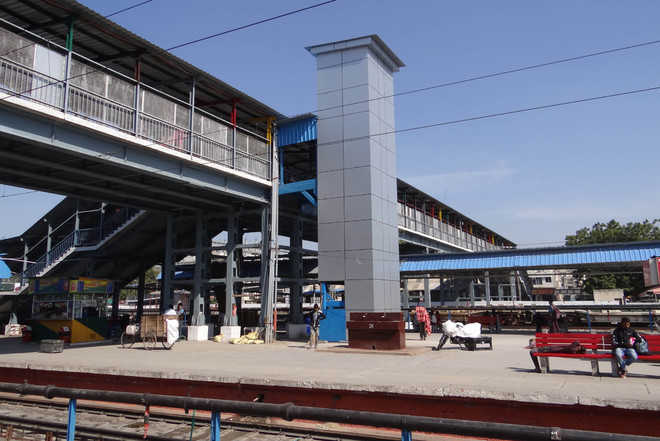 The work to install two elevators (lifts) has been started at the city railway station. Passengers, especially physically handicapped and elderly, would benefit from the move. Railways officials said approximately 60 per cent of the installation work had been completed and the entire project would most likely be completed in a month. Notably, there are no ramps to reach the seven platforms at the railway station. As a result, passengers/visitors have to take the stairs. Physically disabled, elderly and women carrying children have to face a lot of inconvenience. Hundreds of passengers visiting the railway station continue to face difficulty as they first have to walk across a 110-metre-long platform and then use the stairs carrying their luggage to arrive at their designated platforms. A railway official said there was a proposal to install an escalator and a lift each at both sides of the foot over-bridge for the convenience of passengers but work for the escalators could not be started for now due to some technical issues.